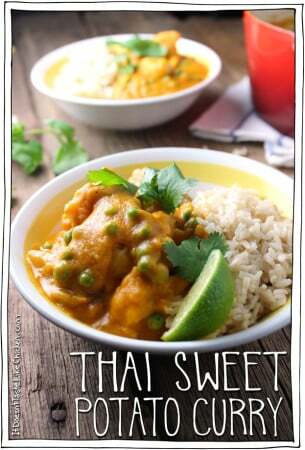 Sweet juicy mango, hearty chickpeas, in a coconut milk sauce infused with aromatic Thai yellow curry on a bed of steamy, fluffy rice. It sounds all sorts of fancy, and it tastes that way too, but this Thai Mango Chickpea Curry is EASY to make. No really, you gotta believe me on this one. It’s Easy with a capital “E”. Just 25 minutes for a perfect weeknight meal. 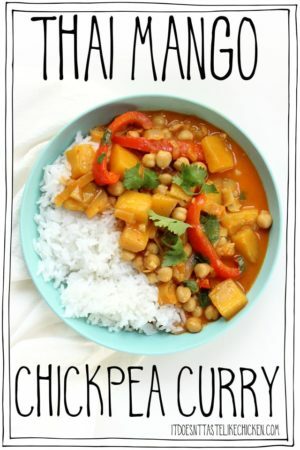 A can of chickpeas, a can of coconut milk, a few tablespoons of store-bought Thai yellow curry paste, chop an onion, red pepper, garlic and ginger, and some mango. Presto! And dude, I even have another hack for you. I made this recipe with fresh mango, but you could totally make it with frozen mango chunks, saving you the prep time. Yeah I know, that just made it even easier! 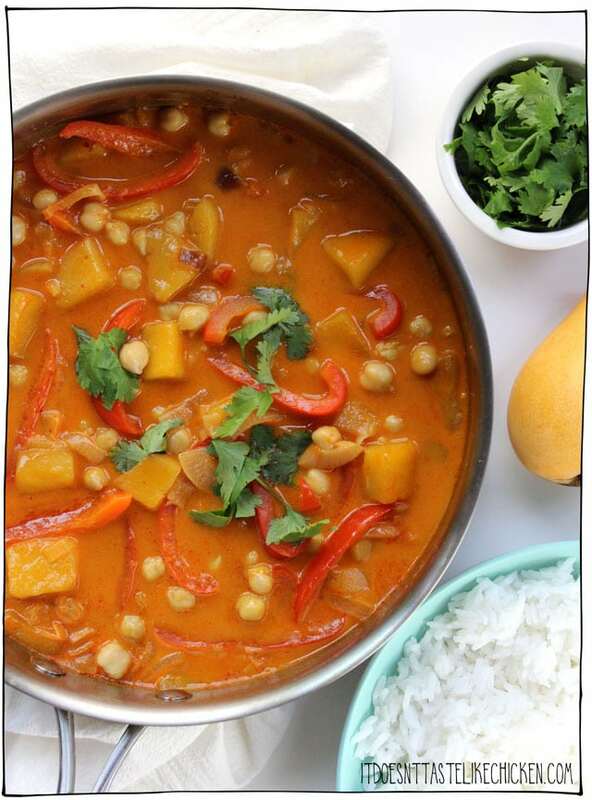 To make Thai Mango Chickpea Curry: in a large skillet or pot heat the oil over medium-high heat. When hot add the onion and red pepper and saute until the onions turn translucent and begin to brown, about 5 minutes. Add the yellow curry paste, garlic, and ginger and cook for an additional minute while stirring until fragrant. Now add the coconut milk, vegetable broth, chickpeas, mango chunks and salt. 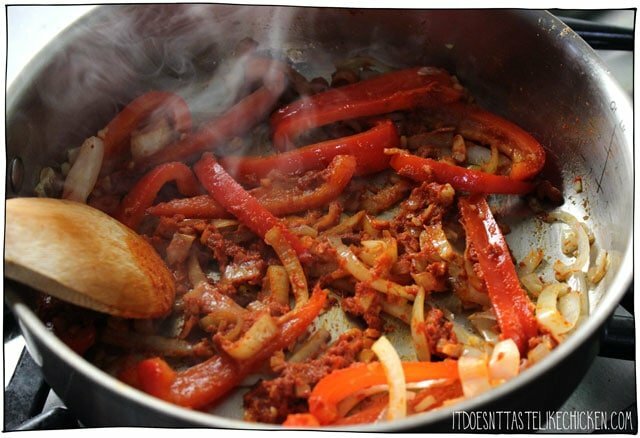 Bring to a simmer and cook for about 10 – 15 minutes until the sauce has reduced and thickened slightly. Garnish with cilantro and serve with cooked rice. An easy weeknight meal- just 25 minutes to make! 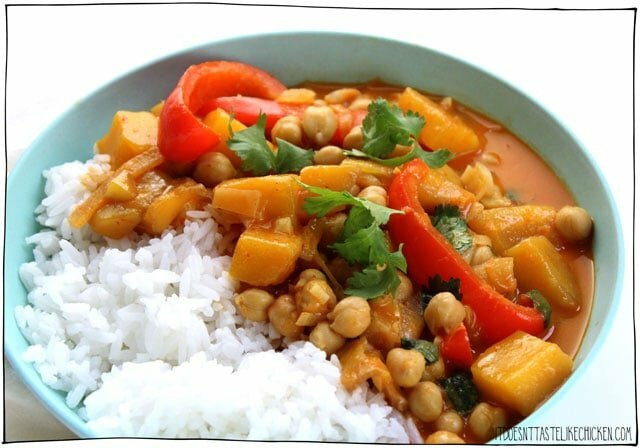 Sweet juicy mango, hearty chickpeas, in a coconut milk sauce infused with aromatic Thai yellow curry on a bed of steamy, fluffy rice. 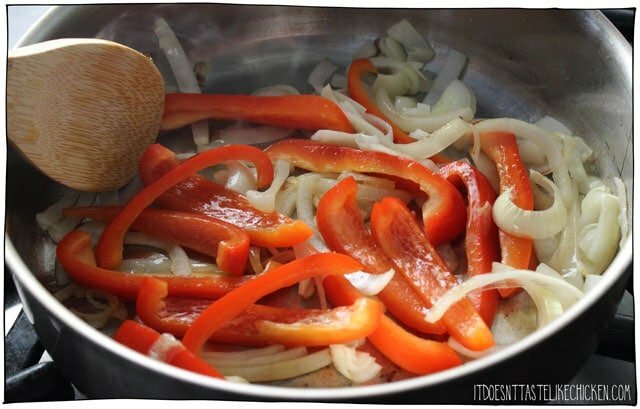 In a large skillet or pot heat the oil over medium-high heat. When hot add the onion and red pepper and saute until the onions turn translucent and begin to brown, about 5 minutes. Add the yellow curry paste, garlic, and ginger and cook for an additional minute while stirring. Now add the coconut milk, vegetable broth, chickpeas, mango chunks and salt. Bring to a simmer and cook for about 10 - 15 minutes until the sauce has reduced a bit. Garnish with cilantro and serve with cooked rice. 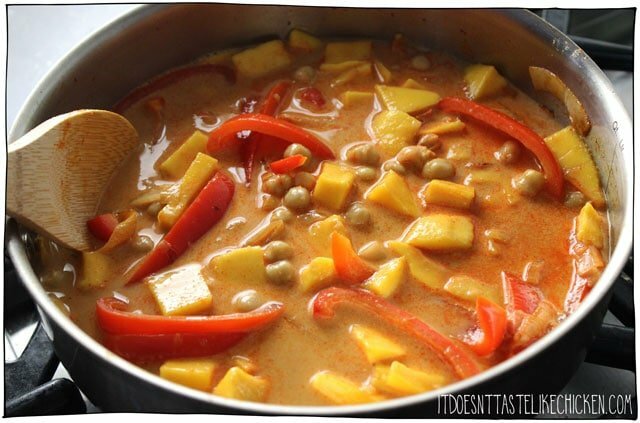 This is a sweet curry, meaning the spice is minimal and kid-friendly but if you are a fan of spicy, feel free to add hot sauce or sauté sliced hot chili peppers along with the red peppers and onions. 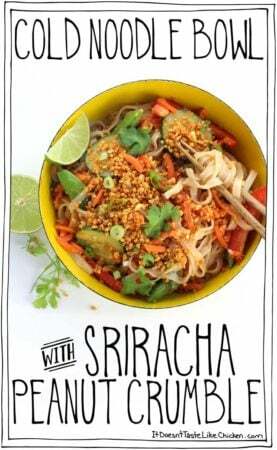 The combo of sweet and spicy is killer... (in a good non-violent vegan way). I imagine it could vary in spiciness depending on the curry paste you use. I used Thai Kitchen which isn’t spicy. Glad you enjoyed it anyways! Can I use curry power? Curry paste is a blend of spices and ingredients so you will want the paste. Curry powder won’t work here. 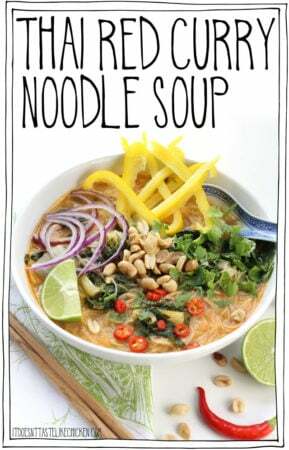 Will definitely make again, might add some tofu & mangetout next time. I finally had a chance to try this recipe last night. Loved it as usual! The combination of the sweetness of the mango with the spice of the curry was delightful. I’m not able to eat onions, so I substituted chopped celery. Really divine. I can’t wait to eat the leftovers for lunch today. Keep sharing your wonderful creations with the world. You know I love all your recipes! Hi Sam! I have that thing where cilantro tastes like soap to me, but I love the green pop of fresh herbs on food.. You’re a professional knower-of-tasty-foodthings; what would you recommend I use in its stead? Would scallions be terrible? Would basil work? But still love this recipe, thank you Sam. Definitelly yummy! I added arrowroot powder just to thicken it up a bit. The recipe looks great. Former editor here, “peice of ginger”-piece and “drianed and rinsed”- drained. Cheers! Haha! Fixed! I appreciate it. 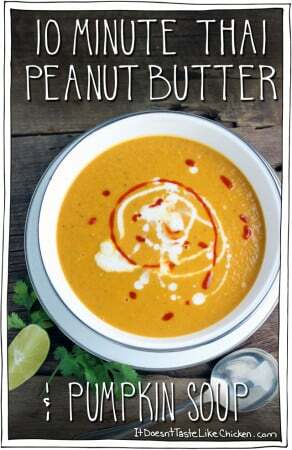 Hi Sam, looks like an awesome recipe, I couldn’t find the yellow thai curry paste anywhere so I purchased red curry paste, my question, is using the red curry paste going to alter the flavor of the dish awhole lot besides making it spicier? Hi Nancy, red curry isn’t generally spicy, it just has different flavourings than yellow curry. So it should be totally fine to use instead of yellow curry, it will just have a different flavour. Enjoy! 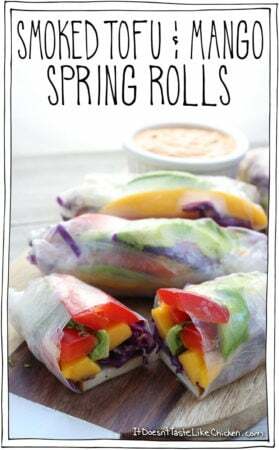 This recipe arrived in my inbox exactly when I needed some food inspiration AND happened to have all of the right ingredients in my kitchen. 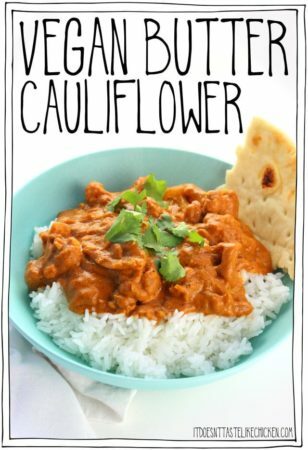 I made this tonight and it was super delish! 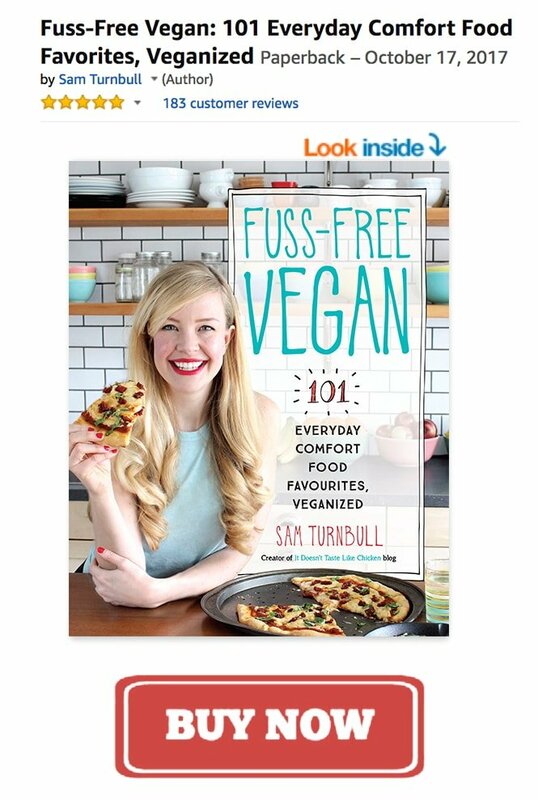 Really really good cook book! Great tip on using frozen mango! Thank you for more yummy goodness.